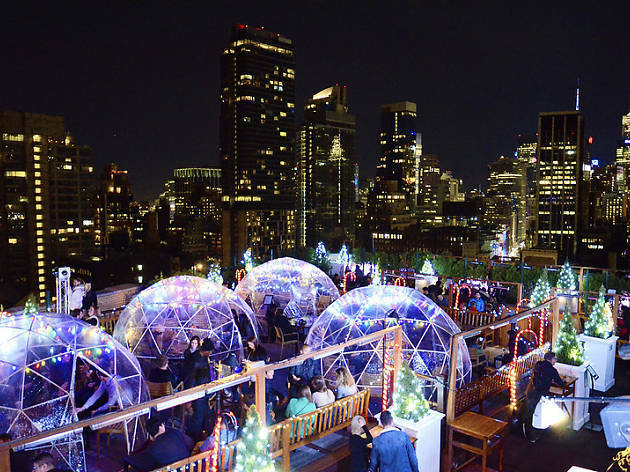 In New York City, you can drink on floating barges, in abandoned water towers and, yes, in rooftop igloos—230 Fifth is bringing back its wintertime bubble tents for the season. 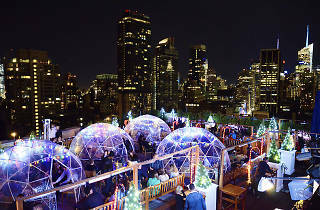 On the partially heated rooftop deck, the see-through PVC igloos can hold up to eight people and keep out the chill while you enjoy skyline views and seasonal quaffs like spiced whiskey martinis and rum-spiked hot apple cider. The tents are available on a first-come, first-serve basis. Now, who said rooftop drinking was only for the summer? Arrived at 3:45pm to see about 15-20 people (mostly tourists) waiting in "line" out front to get in. It's a make-shift line, so once the doors opened, people rushed and pushed through the doors. You walk all the way to the back of the building to board the elevator to the rooftop and then you take a set of stairs to the top. Once you get in, you'll notice everyone rushes to the igloos, completely bypassing the bar. There are no servers here so you have to go to the bar for your $14 cocktail. @Eddie G Love this place ! Where can I I enjoy a cigar.